Want to know all the pro tips for travelling from Athens to Santorini? Then, you’re reading the right text! Travelling to Santorini is a dream coming true for many. But, it can also become complicated, if you don’t know all the tips that will make your trip smooth. Well, we’re here to offer our help! Stay with us and we’ll make you the master of travelling from Athens to Santorini. Travelling with a ferry from Athens to Santorini will be a piece of cake for you, after reading this! Well, this might be a rhetorical question. This is because there is a bunch of reasons why Santorini is in the bucket list of many people! Its volcanic landscape, its romantic sunsets and its breathtaking views are just some of them. Not to mention the amphitheatrically built villages of Oia and Fira. Pure perfection! You might actually need to pinch yourself to know that you are not dreaming! One of the best things in Santorini, is its houses! They are small and white, built according to Cycladic architecture, making contrast with the blue surrounding. Tip: The best way to enjoy the breathtaking view of Santorini is to have a coffee or a drink at one of the many balconies around the island. Wondering if getting from Athens to Santorini is easy? There are many daily ferries from Athens to Santorini. Well, this is not a surprise, as Santorini is such a popular destination. As for the price, a ferry from Athens to Santorini costs around 20 € to 70 €. What’s more, it will take you to Santorini in 5 to 8 hours, depending on its type (regular or high speed). 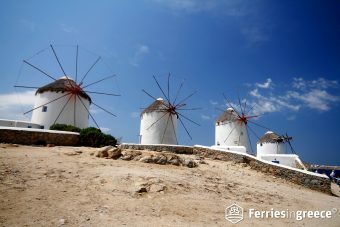 Ferries to Santorini depart both from the ports of Piraeus and Rafina, in Athens. You can choose which one serves you better, depending on the ferry routes from every port. 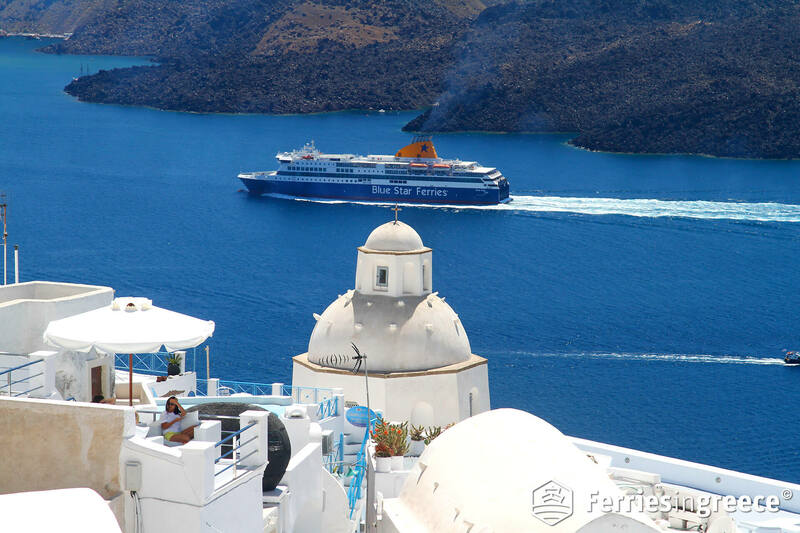 As for the ferry companies serving itineraries to Santorini, Blue Star Ferries, SeaJets and Golden Star ferries are the main ones. But, let’s see their routes in detail! Blue Star Ferries is one of the leading ferry companies in Greece. It serves itineraries from Athens to Cyclades islands and Dodecanese islands. Blue Star Ferries has a morning route from Piraeus to Santorini all year round. This may be a lifesaver for you if you’re planning to travel to Santorini off season! The ferry departs from Piraeus Port at 7.25 and arrives in Santorini, 7 and a half hours later, at 14.55. 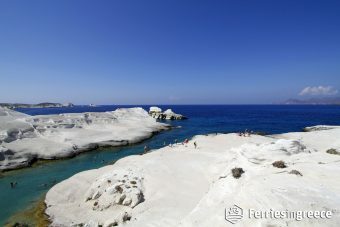 It may also make stops to Paros, Naxos and Ios, before reaching Santorini. Do you prefer to travel in the evening? You’re lucky, cause there is an option for you! Blue Star Ferries has an evening route to Santorini 3-4 times per week that will get you to Santorini after midnight. Every morning, at 7.00, 7.01 and 7.02, three Seajets Catamarans depart from Piraeus port and reach Santorini port, within almost 5 hours, at 11.55, 11.45 and 11.30 respectively. There is also a ferry at 15.30 from Piraeus in Athens, which arrives in Santorini at 21.00. Are you planning to travel to Santorini from Rafina port in Athens? Then, Golden Star Ferries company is the ideal option for you! Golden Star Ferries has a daily ferry to Santorini, departing every morning at 7.55 and arriving in Santorini at 16.30. This is a good way to travel to Santorini from Rafina on a budget, as the ferry ticket costs 35 €. Some days per week, there is also a second ferry from Rafina at 7.15 in the morning, which arrives in Santorini at 16.30. Golden Star ferries also serve a morning itinerary from Piraeus to Santorini. There is a ferry from Piraeus at 7.01 that arrives in Santorini at 12.15. Greek ferries in general aren’t usually overbooked. But it’s better to be safe than sorry, right? Especially July and August are the months ferries are more likely to be overbooked. That’s why we recommend you pre book your ferry tickets online. After booking your ferry tickets online, you’ll have to pick them up from a specific spot. Pick up points vary, depending on the ferry company you’re travelling with. An even more convenient option is to have them delivered to you. Therefore, you’ll get straight into your ferry, without having to wait to get your ticket. An alternative is to buy your ferry tickets at a travel agency. You can simply walk into a travel agency during your stay in Athens, ask for information about the routes and select the one that serves you. So, you’ve just arrived to Athens airport and planning to get to the port. You better avoid unnecessary delays and hop on your ferry in time, right? We’re on the same team here! That’s why we present you all the possible options to get from the airport to the port smoothly. If you’re planning to go from Athens airport to Piraeus port by taxi, it will take you about an hour. As for the price, you’ll pay 50 € to 60 €. Otherwise, if you’re travelling to Santorini from Rafina, the distance from the airport to Rafina is about 15 minutes. Expect to pay something between 25 € and 35 €. Taking a bus to Piraeus port is a much cheaper option. This is because the bus ticket will cost you just 6 €! 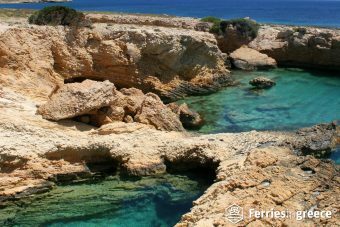 Bus service from Athens airport to the Piraeus port is provided 24/7 all year round, including holidays. The bus serving the itinerary to Piraeus port is X96. It will get you to Piraeus in about 90 minutes. You can buy bus tickets at the info/ticket kiosks, which you’ll find between the Exits 4 and 5 at the airport. What’s more, X96 bus has frequent routes, leaving every 30 minutes from the airport. 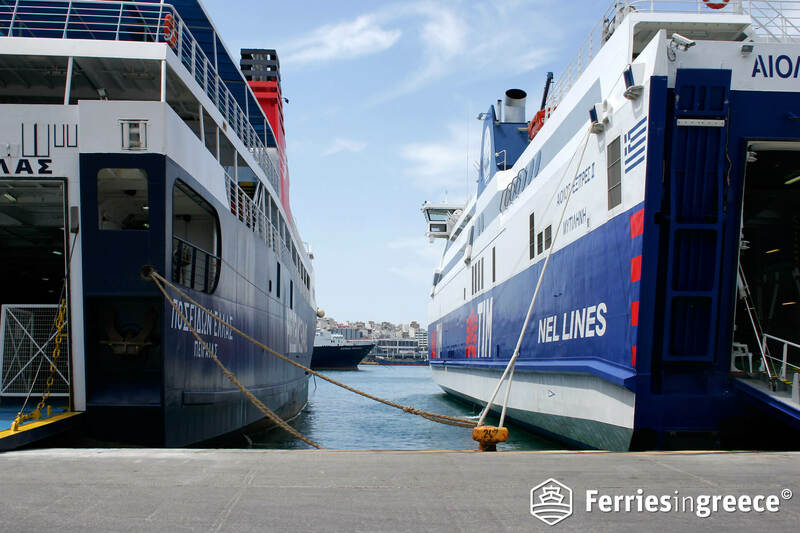 Is your ferry leaving from Rafina port? Then taking a bus from the airport to Rafina is a good option. The bus to Rafina is leaving from a bus stop between Exit 2 and Exit 3 of the airport. The routes are frequent, as the bus departs from the airport approximately every one hour from 6.00 until 21.45. The best part is the bus ticket costs only 3 € and you can buy it from the bus driver. As for the distance, it will take around 30 minutes to arrive at Rafina Port. 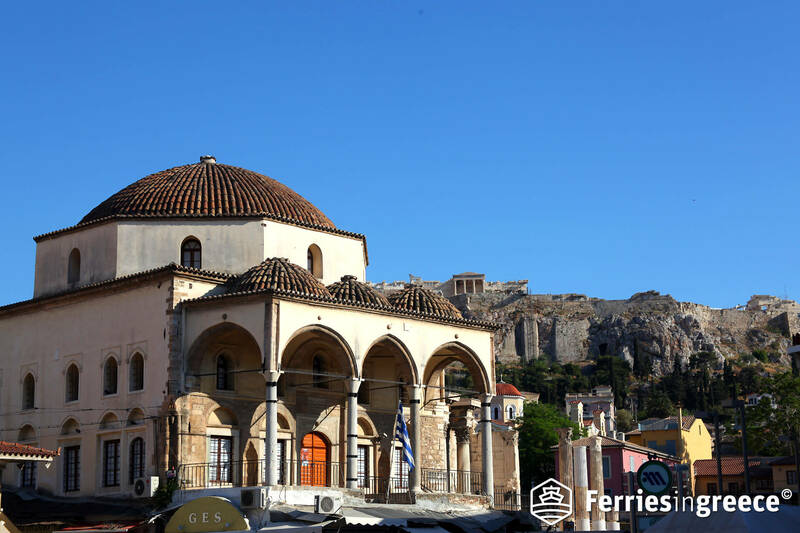 Are you in downtown Athens, enjoying some sightseeing before your island trip? No worries! Getting to Piraeus port from downtown Athens is quite simple. Getting to Piraeus port from downtown Athens using the metro (Line 1) is the easiest thing! Taking the metro from Monastiraki Metro station, at Monastiraki Square or from Omonoia Metro Station, at Omonoia Square, will get you to Piraeus in 20-30 minutes. As for metro tickets, they cost 1.40 €. Metro is open from 5.30 in the morning, till midnight. Plus, it has frequent routes every 5-10 minutes. Travelling with a ferry to Santorini means you’ll arrive at Athinios, the new port of Santorini in Thira. Buses from the port will take you to Fira and all the villages of Santorini. Bus schedules are set depending on the arriving times and departing times of the ferries. An alternative to get to your hotel is by taxi. There are many taxis in Santorini and at the port, so you won’t have hard time finding one. Taxi rates are set every year, depending on the destination and the touristic season. Tip: The best option to get to your hotel fast, in the most convenient way possible, is to book your transfer. This way, you won’t have to worry about finding a taxi! 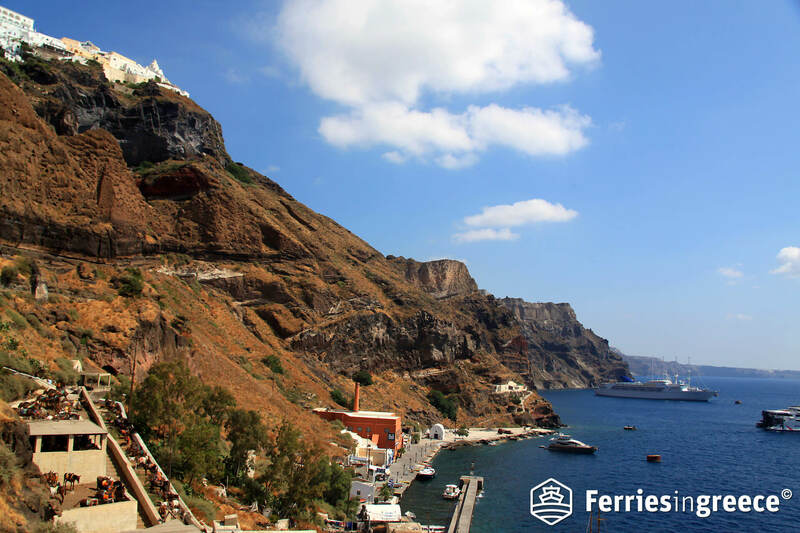 So, it all adds up to this: Getting a ferry to the magical Santorini island is just the beginning of the adventure! With all the info you have in hand now, it should be one of the easiest trips of your life. 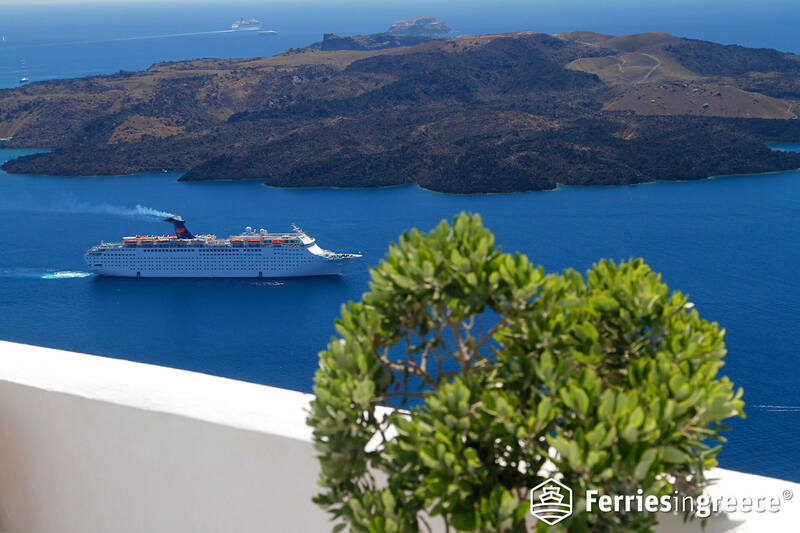 So, book your ferry tickets to Santorini and prepare to live your best holidays ever!